There is a "growing radicalized environmentalist faction" in Canada that is opposed to the country's energy sector policies, according to a newly declassified intelligence report obtained by The Canadian Press. There is a "growing radicalized environmentalist faction" in Canada that is opposed to the country's energy sector policies, says a newly declassified intelligence report. The RCMP criminal intelligence assessment, focusing on Canadian waters, cites potential dangers from environmental activists to offshore oil platforms and hazardous marine shipments, representing perhaps the starkest assessment of such threats by the Canadian security community to date. The report drew a sharp dismissal from Greenpeace -- a prominent environmental group singled out in the document -- which suggested it could simply be an effort by security authorities to tell the Harper government what it wants to hear. The Canadian Press obtained a heavily censored copy of the September 2011 threat assessment of marine-related issues under the Access to Information Act. The report was compiled by the Mounties with input from the Canada Border Services Agency, Canadian Security Intelligence Service, Defence Department, Fisheries and Oceans and Transport Canada. Contributing agencies reviewed the resulting assessment. "The Canadian law enforcement and security intelligence community have noted a growing radicalized environmentalist faction within Canadian society that is opposed to Canada's energy sector policies," says the report. "Greenpeace is opposed to the development of Canada's Arctic region, as well as Canada's offshore petroleum industry. Criminal activity by Greenpeace activists typically consists of trespassing, mischief, and vandalism, and often requires a law enforcement response. "Greenpeace actions unnecessarily risk the health and safety of the activists, the facility's staff, and the first responders who are required to extricate the activists." 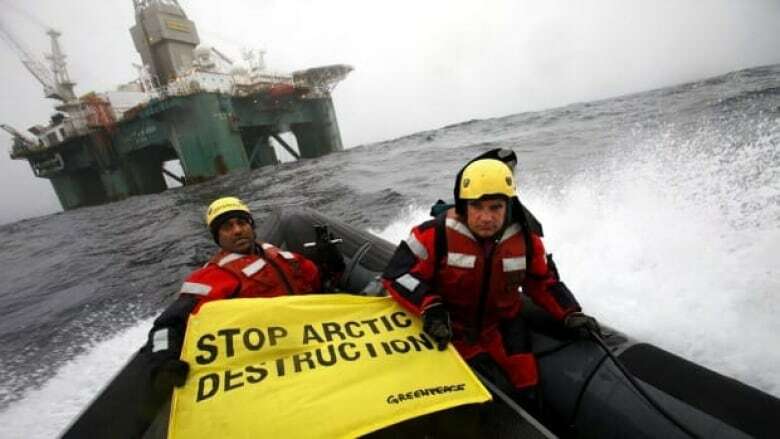 Recent protests off the coast of Greenland involving Greenpeace vessels MV Esperanza and Arctic Sunrise "highlight the need to be prepared for potential threats to the safety and security of offshore oil and gas platforms." "Tactics employed by activist groups are intended to intimidate and have the potential to escalate to violence." For years CSIS has cited the potential for the most extreme environmentalists to resort to violence. But some critics have accused the Conservative government of taking the message much further with none-too-subtle warnings about "environmental and other radical groups" bent on derailing major oil, forestry and mining projects. Yossi Cadan, campaigns director for Greenpeace Canada, said while group members sometimes trespass on private property to make their point, the group shuns violence. "We're peaceful and non-violent. We are taking direct actions, but it's never violent," he said, adding "safety is a No. 1 priority for us." "There is a difference between breaking the law and criminal activities," Cadan added. "It's true that the distance between the government policy and the environmental movement is growing, but I don't think that the movement is getting more radical." It seems that anyone who disagrees with the government on subjects such as the Alberta oilsands "has become an enemy in many ways," he said. Cadan accused the federal government of trying to avoid the real issues by publicly attacking opponents. "It's not going to work because we are going to continue and focus on the environmental issues." For its part, CSIS denies any ideological bias against environmental activists, saying in a recently declassified memo from earlier this year that, "Needless to say, such accusations are patently untrue." Overall, the 2011 RCMP-led assessment of Canadian waters found criminal organizations continue to exploit marine ports, waterways and waterside infrastructure to smuggle drugs, people and other commodities including stolen vehicles. In addition, the report says illegal fishing remains a problem, and Canada's expertise in maritime and scientific fields makes it "an attractive target for espionage." Increased accessibility to ice-free Arctic waterways may also result in greater commercial fishing and vessel activity, says the report. The boost in traffic, along with a commercial fisheries ban in the Beaufort Sea, "could lead to an increase in illegal, unreported and unregulated" fishing in the Arctic, it adds. The assessment concludes there is a need for strategies "to detect and disrupt threats" before they occur.